4. Feel better, stronger, healthier, because you are! The compliments come in (usually). Your doctor brags on how good your blood work looks. People tell you they are proud of you (usually). You wear smaller clothes. Sometimes you even wear smaller shoes! You find TONS of NSVs happening that you didn't even think about as NSVs when you were heavier. But something doesn't get fixed from weight loss surgery. Something that CAN'T be fixed by weight loss surgery. You are going to LOVE losing all that weight, looking and feeling better, moving better, the compliments, etc...but the surgery will NOT make you LOVE YOURSELF any more or any less. No matter what you think. You may love your life more, but that usually only happens to those who already love themselves. The surgery doesn't fix your mindset. It doesn't fix your constant nitpicking at your faults. Weight loss surgery can contribute to improved mentality and body image, but it won't fix a broken sense of value, a sense that you are not "good enough". You have to do this yourself. Ain't no place inside you the surgeon can reach to fix that. If you need counseling, seek it. It helps a lot of people, but ultimately, if you don't feel it, live it, and believe it, you won't have complete success. You won't have that completely improved self image you expected from having WLS. This holds true for those of you who are on a weight loss journey without having surgery. Losing weight helps your self esteem, but you have to have self esteem in the first place. You have to know you are good enough, worthwhile, a treasure. So, Are you friends with yourself? Are you in a loving, giving, and FORgiving relationship with yourself? If not - why? You are the most amazing YOU there is no matter your size, shape, or where you are on your journey to a healthier lifestyle! You also can't love others completely until you love YOU completely. Accept what you perceive to be your faults and shortcomings. Embrace your uniqueness. I have an assignment for you. 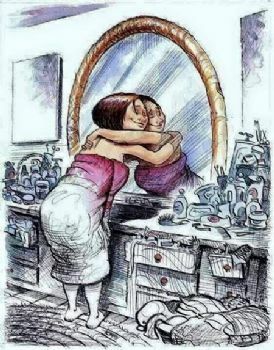 Look in the mirror and say, with all the warmth in the Universe, "I love you". Mean it! Then give yourself the most comforting hug ever. Yeah, I mean it. Go do it. Do it every day until you feel it, know it, believe it. Focus on every good aspect of your character, every lovely curve of your lip, the flecks of lovely color in the iris of your eyes, how giving you are, how well you sing, how your hands can create beautiful things, how well you master trivia games, every little wonderful thing that makes you the amazing creation you are. So, what are you hanging around here for? There's a mirror waiting for you. Go. Now! Very important message. I'm a nurse hoping to land a job with a bariatric surgeon after my husband and I move to California this month. I worked with a couple of gastric bypass patients while in nursing school and also have worked with patients dealing with weight issues in my current job. I love being able to support these patients as they are on this journey. It's a joy to watch them blossom as they lose weight and feel better about themselves and I also enjoy being someone to help facilitate that positive feeling in them. All the best to you! You are spot on here! It is true and the reason why a lot of people end up putting the weight back on and that is whether they lost it with WLS or with diet alone. We have to feel that we are deserving of this! That we are good enough! And that is why I think I have been successful this time. Fantastic blog! I love this post, MJ. Thank you for sharing! Great point! I am currently waiting to get WLS and I agree with you. There is a lot of mental and emotional work that needs to be done before and after surgery by the individual. Realistically we need to realize surgery is just a tool. It isn't a magical cure all.